Compared to the few episodes of Tokyo Ghoul that have been released recently, with all the pacing and story telling, I was pretty worried about this last episode. But it was amazing. Remember episode one, where we get to see all the horrific details and the emotional turmoil that Kaneki endures while turning into a ghoul? Well, this episode brings back those terrifying themes, and it delivers wonderfully. Last episode, we didn’t get to see Kaneki’s face at all, and you’re basically left in the dark to wonder what exactly he is going through. This episode backtracks a bit, to give the viewer a better understanding of what was happening to Kaneki and what caused him to change his hair color. Here it is, in a nutshell. And while all this is happening, he’s hallucinating Rize. She takes him back to the days when his mother was still alive. This is great because it gives us a better understanding of what exactly happened to Kaneki’s mother and how exactly she died, so kudos to the director for shedding some light on that for us. After all of this, Kaneki is forced to accept what happened to his mother, and in turn, somewhat resent her for choosing work over him. For choosing to pay her sister, rather than spending time with him. He’s left screaming for his mother, wondering why she didn’t just choose him over all of those things. Rize, who is egging all this on, is later devoured by Kaneki, hence his hair turning white as he finally accepts his ghoul side. What I love about this episode is that it dives so far into the depths of Kaneki’s mind as he’s spiraling downward toward the side of him that he’s tried to repress this whole season, and we finally get to see him stand up for himself and completely wreck everything around him. He’s merciless, he fears no pain (example; he twisted off his own leg because Yamori simply wouldn’t let go. Yikes. ) 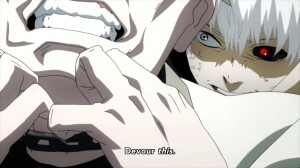 and he appears to be gaining the characteristics of Yamori, even after taking one simple bite out of him. 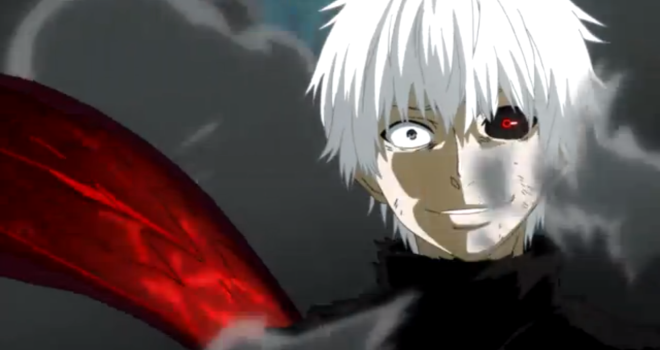 Did you guys enjoy Tokyo Ghoul? What was your favorite moment? Will a second season ever come to be? Let us know in the comments below!